The cancer has spread to Jamie's liver, and he's dying from liver failure. 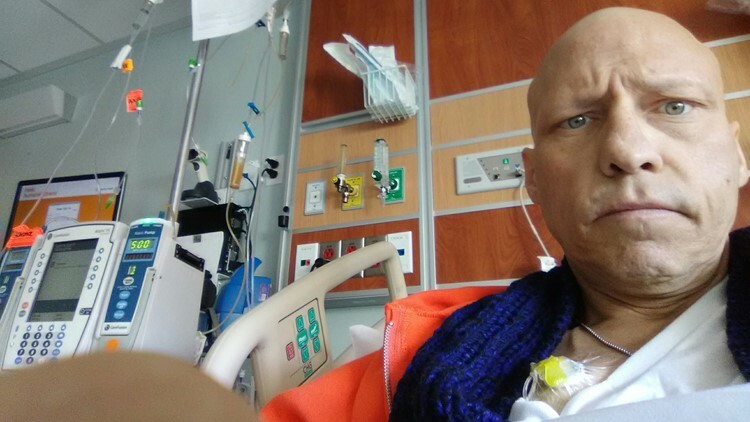 After he was given his diagnosis, his fiance told him she didn't want to watch him die. SACRAMENTO — Miniature soldier figurines stand watch on the windowsill beside the door to Jamie Murphy’s motel room. They’re his protection, he says, as he looks for his blue room card in his wallet. Inside the room, more figures: a wooden nativity scene, a Rudolph Pez dispenser, and a plastic Donald Trump toy giving the thumbs up. There’s also a photo of Christ Pantocrator, and another Catholic iconograph depicting a woman holding a quill. Jamie has taken the time to make this place feel like home. And for now, it is. If he’s lucky, he’ll die here. A portrait of Jamie Murphy in his Sacramento motel room taken on Sunday, May 13, 2018. The cancer has spread to Jamie’s liver, and he’s dying from liver failure. After he was given his diagnosis, his fiance told him she didn't want to watch him die. “I was asked to leave,” Jamie says. He’s been homeless ever since. Homeless and dying of terminal cancer. A former care-giver with In-Home Supportive Services, Jamie’s now in need of some of that same assistance he once provided. Problem is, there are no hospice or palliative care centers for the homeless in California, so he’s taken refuge in a Motel 6 in Sacramento to die with dignity, at least until his money runs out. If that happens, he'll be back out on the street, waiting for his cancer to kill him. Then there's the question of medication. In 2016, the latest year the numbers were available, at least 14 homeless people found dead on the streets of Sacramento passed away from a terminal illness, which is why Dr. Von Friederichs-Fitzwater founded Joshua’s House, a non-profit facility that will allow the homeless to die in a safe, comfortable space. “We have people with advanced cancer and heart disease and diabetes who are dying on the street, and when I learned that, I was shocked,” Von Friederichs-Fitzwater says. Dr. Von Friederichs-Fitzwater lost her grandson, Joshua, to a drug-overdose while he was living on the streets in Omaha. She’s naming the 20-bed facility after him, and says it’ll be a place where people like Jamie, who’ve been discharged from the hospital with a terminal illness, can spend their final days in a home-like, comfortable space and allow their hospice teams to treat them in a safe environment. It’ll be the first facility of its kind in California, and the eighth one in the country, Dr. Von Friederichs-Fitzwater says. “We know the hospitals are going to be telling me we’re going to be full the first week, which tells you the extent of the problem, but it’ll be a start,” Von Friederichs-Fitzwater says. The facility’s approval is still facing an appeal from the neighborhood association, where it will have to convince the public, and people like Jeffrey Rea, who owns the adjacent flooring business, that Joshua’s House will be a welcome addition to the area. The future location of Joshua’s House — located in a historic armory in the 1500 block of North C Street— is also home to other social services such as Loaves & Fishes, Volunteers of America and the Salvation Army. Rea says the area is inundated with homeless, and is worried that Von Friederichs-Fitzwater’s facility will draw even more people outside his business. But Von Friederichs-Fitzwater says Joshua’s House will not accept walk-ins. Residents must be discharged from a hospital and show proof of their terminal illness diagnosis to be eligible for a bed. If Joshua’s House conditional use permit for residential care facility is approved by the Sacramento City Council on Tuesday, May 15, it still isn’t slated to open until the Fall of 2018, about a year from Jamie’s 12-month prognosis given to him last year. Jamie Murphy in the hospital. For now, he’s waiting for death in his motel room. 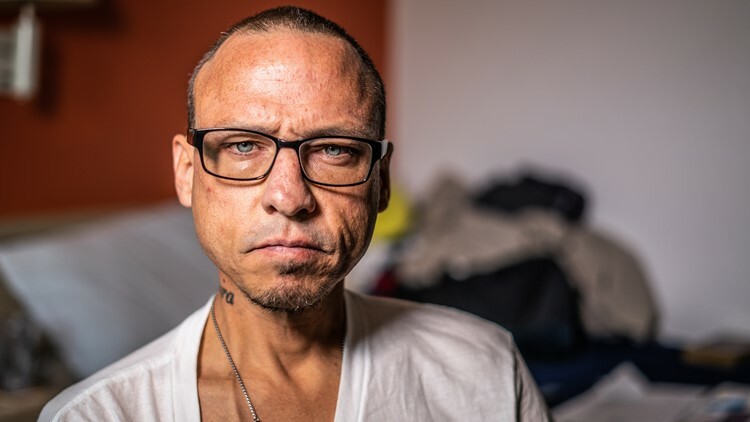 He’s set up a GoFund me account for people to help him pay for additional nights in the motel, but he says a couch or garage would be preferable to the alternative: dying on the street. Follow the conversation with Michael Anthony Adams on Facebook.